The Old Town of Avila with its Extra-Muros Churches has the best preserved medieval walls in Spain. They date from 1090, and today are 2,5 km. long with 88 towers and 6 gates. Ávila is the Spanish provincial capital situated at the highest altitude, and on this vantage ppoint 1130 metres above sea level its medieval scenes remain in enviable health: churches and convents bred in the Romanesque period, and the Renaissance palaces and mansions of the Castillian nobility. When I visited Ávila in December, it was freezing cold. I wished I had brought my mittens! The town is situated 1130 meters above sea level, hence the climate. The no.1 thing to see and do here is to walk on the city walls. From here you have the most beautiful views of the medieval town. I visited Avila in March 2019 after spending a couple of days in Segovia and found the first impression quite stunning. The city walls in the evening sun are quite a site and Avila clearly deserves its WHS status just for them alone. The walls are mostly built between the 11th and 14th century but seem based on little known older structures. They really look in perfect shape and they are repaired all the time. This is great but one wonders how much material has been exchanged in the process. Beyond the walls the eastern area of the city is also very impressive and has a certain time traveling quality: The area within the walls around the Cathedral and the churches just outside the eastern wall. In the western half of the cities’ rectangle you have the strange phenomenon that you see in many Spanish cities: The streets follow the medial street plan but the buildings are all quite new or so modified the the old structure became unrecognizable. The second great seller for Avila beside its walls is its local mystic Saint Teresa of Avila who lived in the 16th century and who was obviously of great importance for the Spanish counter reformation. 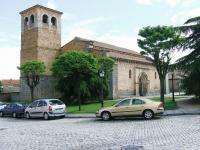 The original nomination includes four extra muros churches. Of these San Vincente to the cities north east turns out to be a real jewel, less overwhelming but more harmonious then the great cathedral. San Pedro is also nice but artistically less rich. San Andres is rather simple and beautiful but smaller and closed. The same is true for San Segundo. ICOMOS considers that the three churches and three convents, although not of outstanding universal value in their own right, should be incorporated into the inscribed area as being part of the overall distinctive urban fabric, pattern and ensemble for which the site was originally inscribed. It is interesting how dry ICOMOS comments on the lacking OUV of the churches but includes them any way with little explanation for the „urban fabric“. As I try to see every important element of any WHS I visit I went naturally to check out as well the then extramuros churches and their OUV. When I walked to the northern side of the city I passed first the churches of San Martin and Santa Maria della Cabeza. Both are closed meaning I couldn’t find any opening times anywhere. From the outside they are both extremely simple but so simple that you would not look twice if you passed them in any Spanish village. One almost expects a marvelous interior to compensate for the dissappointing exterior but I do not think this is the case. The main goal on the northern side is the Convent of La Encarnacion were Teresa entered a convent for the first time. There is a nice courtyard and a little museum about the Saint which I visited. The museum is in three seemingly original rooms of the still working monastery. You see her cell from the time when she was the prioress of the convent and of course many relics such as the wood block she used as a pillow for repentance. The most interesting fact was almost that the pious museum lady who bowed at every corner and image locked me up into the convent/museum and left me alone with the saint and the precious relics. I had to pull a bell to be released. There was more locking and unlocking when she showed me the church which was totally remodeled in baroque style and in its overly painted and decorated structure even less attractive then the to previous churches in there poverty. Walking east I got first to the convent of San Jose which is the first convent founded for Teresa’s new order of the shoeless carmelites. Here you can only see a dark and gruesome museum of more relics which lacked even the historic rooms of the former convent. I abstained from visiting since you can’t see any part of the convent or church which seem completely closed to the public. From outside the church looks totally renaissance. I do find it touching though the Teresa revered St. Josef, a rather marginal saint even in most catholic areas, so much that she named her first monastery after him. The images of daddy Josef with child Jesus hand in hand are a nice counterpart to the omnipresent madonna with child. Ten minutes further out of town is the largest monastery of Avila: San Tomas. This has a big church and three cloisters of different sizes and styles. It is strongly linked to Queen Isabelle since some of the rooms were built for her (spanish kings strangely build there palaces preferably within monasteries) and she made the church the burial place of her only son you died young. While I really like some buildings built by or at least in the orbit of this queen such as the Segovia cathedral or San Juan de los Reyes in Toledo, I could find almost no appealing elements in this complex. As often in Spain the architecture is seems rather heavy, serious and uninviting. It is kind of funny that the moors whom Isabella dispelled were the absolute masters in creating inviting and magical interiors. The most attractive part of the monastery is perhaps the Asian museum in the last courtyard with some nice Asian artifacts with no connection to the city or the monastery whatsoever but the fact that the monks evangelized in those countries. There is also a so rather dusty natural history museum full of stuffed animals from all continents which felt too depressing to me at the moment. The first four extra muros churches of the Avila inscription are all Romanesque or Romanesque/Gothic and build a certain stylistic groupe which is not too far from the time in which the town walls were built. Of these four San Vincente is the only one with clear OUV in its own right. It is interesting that in Segovia several Romanesque churches that are comparable at least to some of these churches were not even considered to be included into the Segovia core zone along with even more significant buildings to the north of the town such as the church of Vera Cruz and the Mint. Among the further six churches that were later included I cannot find any that has any OUV and certainly none that is of the „same artistic value“ as the first four churches. Further on, several of them are not „of the same period“ since they are either late gothic such as San Tomas or even Renaissance such as San José of even completely remodeled in baroque style such as the church of La Encarnacion. One could also work out a connection with their relation to Teresa but this is also only obvious for La Encarnacion and San José among all extra muros churches. I think it is very curious that ICOMOS did not notice that there is neither the claimed common style period nor a comparable artistic value. Perhaps they just didn’t bother to check. If you are not a thorough and slightly obsessive WHS visitor like me then you are fine if you visit San Vicente (give this one at least half an hour) and San Pedro of the extra muros churches. Of the churches within the walls the Cathedral is a must but I found no other church impressive. Only the Capilla de Mosén Rubí seems beautiful but was not open in the early evening hours as announced on the web. In general I found this website the most helpful about opening times: http://www.avilaturismo.com/es/que-ver. To stroll through the lanes in the the eastern part of the city and around the city walls is a real pleasure. There is also a lovely flemish triptych in the Museo de Avila. I visited this WHS in June 2015. I drove from Segovia and spent a whole day here. I parked my car for free just before the city proper at a famous panoramic viewpoint called Los Cuatro Postes. From here the magnificent city walls can be seen very well and they are just a short walk downhill. While crossing the small bridge to get to the city I spotted several song birds and frogs and since it was a lovely day I decided to hike around the whole city to take in the city walls. You can also go on the city walls themselves but in my opinion the best views are from beneath the walls not on them. The church which is dedicated to St Teresa is worth visiting as are the imposing city gates and minor churches. I enjoyed my visit even though there are similar WHS on the list such as Provins and Carcassone. The city is quite touristy and it reminded me of Obidos, a non-WHS I visited recently in Portugal. Its huge town walls and well-preserved medieval city centre make Àvila one of Spain's most popular destinations, and a trip there adds an element of time travel. Wandering its streets and visting its many Gothic and Romanesque churches puts one right into the 16th century, with local saints Theresa and Juan de la Cruz about to appear at any moment. I only had a couple of hours to spend in this impressive city, but I managed to fit in a visit to the cathedral (which is actually integrated into the city walls), the basilica of San Vicente, the Convent of Santa Teresa, and the Royal Monastery of Santo Tomás, with its interesting museum and 3 cloisters. I think I caught Avila on a bad day. It seems that a Monday morning in November doesn’t show this city in its best light. Being a Monday in continental Europe most of the main sights were closed, however I was surprised to find out was that this also included the town walls, meaning I didn’t get to stroll along one of the highlights of the town. I did however get to visit the cathedral, which was pleasant enough. The church in the convent of St Theresa was rather standard, and most of the other churches were locked. I did like the charming Romanesque church of St Vincent outside the walls though. There was a lot of construction/ restoration going on in the town as well which again limited access; one success story of this though was the charming restored palace just inside the city walls. I also enjoyed walking around the new central market looking at the incredible selection of offal, and having a friendly greengrocer increase my Spanish vocabulary in regard to fruit and veg. On the food side, I’m afraid I can’t agree with Frederik on Yemas de Santa Teresa. I found them far too sickly and they were a distinct failure in the office taste test; consigned to the lower ranks of my foreign treats alongside the likes of Korean ginseng candy and Croat spicy fig cake. I could see that Avila could be a worthwhile destination, however strolling around its closed city centre on a grim Monday in November it didn’t capture me, but then perhaps I wasn’t doing it justice and a repeat visit in the summer may show it in a better light. 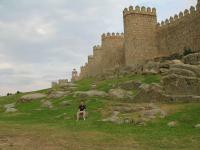 The walls, towers and elaborately carved stone gateways to the city of Avila are indeed majestic. And while others have commented on the churches outside the walls, my favourite is the Hermitage of San Segundo, a small building nestled beside the Adaja river. From here I crossed the river and walked up to the Four Posts monument, from where there is a panoramic view of the city walls from the west. From the lookout bus #7 goes back to the station. 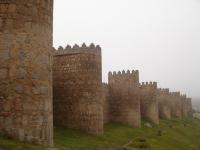 While its religious monuments are worthwhile sights, the main attraction in Avila are the walls that surround this city. My dad and I arrived from Segovia (see my review) quite late in the afternoon so I did not have time to see too much. Besides the magnificant walls, we managed to visit the interior of the San Vicente Basilica (under restoration but cheap admission and even comes with a free postcard) and the local cathedral (also under restoration but contains beautiful tombs). While walking on the walls was pleasant and a great way to see the surroundings, I have to concur with Frederik Dawson that the walls look a lot better from the ground. Avila's walls, along with their numerous churches, make this place a great WHS and one definitely worth visiting. 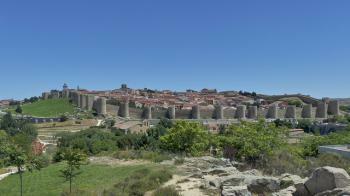 From all six world heritage sites near Madrid, Avila is my favorite site better than Toledo or Segovia in my opinion. 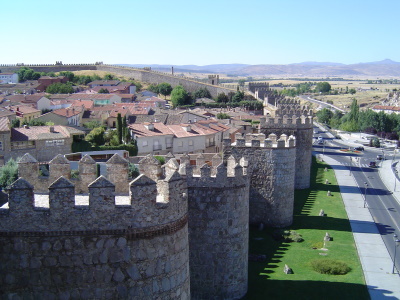 Situated on high hills northwest of Madrid, Avila is well known for its cool climate and the holy story of Santa Teresa. Santa Teresa did not make Avila to be a pilgrimage place, that put this town on travelers map, liked Santiago de Compostela, but its city wall is the reason that put Avila on the top list of every tourist’s mind. Avila’s medieval wall is considered as one of the best preserved city wall in Europe, and maybe one of the most beautiful I have ever seen. Walking around the old town to see the wall is just great activity for me especially on the eastern side. The wall is really picturesque and contains some element of mystery of medieval age that made this place so charming. I do not recommend you to walk on the wall as the feelings are so different and I personally preferred to walk on the ground which I think this way is better to make you appreciate this place. I have to say I really enjoyed the wall and seem to ignore another part of world heritage – the extramuros churches. But if you come to Avila, your eyes will directly gaze to the wall not the churches which are just next to the wall liked me. However, the churches are really nice and deservedly to get your time. Avila is really well connected by train with Madrid and can be combining with the trip to Salamanca. When you are in Avila don’t forget to try its special delicacy – Yemas de Santa Teresa (a sweet made with egg yolks and sugar) a really great plus for the visiting. Avila was the most amazing place, but recently they have destroyed so much of the town and it has lost much of its charm. The new building in the Plaza Major is horrid, as is the new Plaza Major. It is very sad. I spent almost every summer of my life there and my mother lives in Avila. Our entire family is very upset at the horrible things they are doing to our once favorite place. 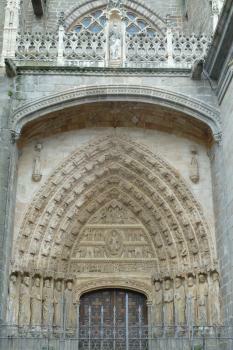 The Inquisition: Monasterio de Santo Tomas. The Spanish Inquisition (Avila Branch) used to meet in this 15th century Gothic structure. 224 Community Members have visited.